Jim and Greg take down the worst musical turkeys of the year in our annual Thanksgiving Turkey Shoot. Plus they review the new record from Oakland-based agit-rappers The Coup. Cassette tapes aren‘t just for boutique indie labels anymore. At least that’s what IBM is betting. The company has developed a tiny cassette tape that can store up to 35 terabytes of data, and it's touting it as the“new”green technology. Unlike server farms, researchers point out, tape at rest consumes zero energy. Need more proof the cassette's not dead? Greg suggests taking a gander at the rare Radiohead cassettes currently up on eBay. Well, it's official: '90s nostalgia has arrived. CBS just announced the development of new sitcom, Smells Like Teen Spirit. The show follows a young entrepreneur as he tries to launch an internet startup with help from his“1990's indie rock parents.”Which got us thinking - what other alt-era hits could be re-purposed as TV pilots? Coming to a station near you, the hilarious rom com Black Hole Sun? Or the detective show Losing My Religion? Jim and Greg have their fingers crossed that Sorry to Bother You, the sixth album from Oakland-based hip-hop group The Coup, isn't a turkey. This band has been making consistently good agit-rap records since 1991, Greg says, but they remain best known for an unfortunate incident involving their cover art. Does the band deliver on Sorry to Bother You? Jim says yes. He wouldn't blame you for mistaking "The Magic Clap" for a new OutKast party anthem. 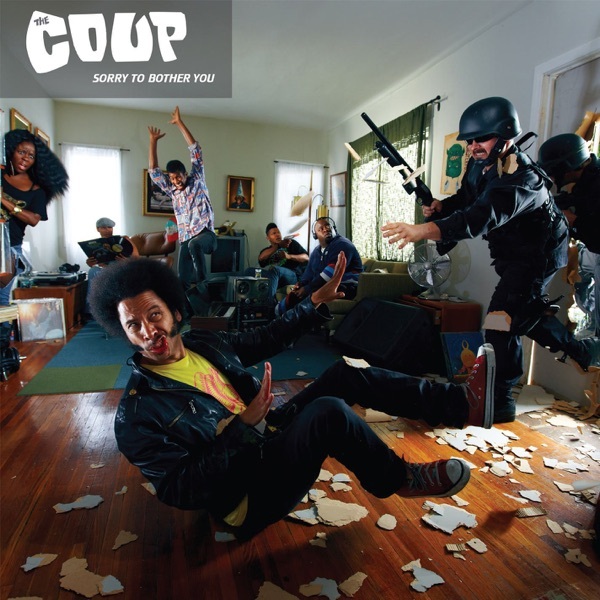 The Coup has verged dangerously close to Rage Against the Machine self-righteousness in the past, he says, but on Sorry to Bother You, the band's got the“party to politics”ratio just right. Greg agrees and calls it the best Coup album yet. Sorry to Bother You gets a double Buy It. Soul singer Cody Chesnutt has a new album out, reminding Greg that he's often left off the list of masterful vocalists. This is most evident on his 2002 album The Headphone Masterpiece. In fact, The Roots were such fans they re-worked his song "The Seed" into "The Seed (2.0)." and released it as part of their album Phrenology. Greg takes it with him to the desert island this week.